Marja Mattlar is an individual Finnish singer-songwriter. Her music is based on poetical lyrics and strong atmosphere. Marja's intention is to make albums that are direct, uncompromising and will, musically, stand the test of time. This conviction to her art has been a key factor to the success of her debut album Pariisi–Vuorenkylä that has continued to sell steadily since its release in 1993 with no signs of abating. Pariisi–Vuorenkylä ('Paris–Vuorenkylä') was recorded in Paris under the guidance of producers/musicians Gabriel Yacoub and Patrice Clementin. The album's title points to opposite ends of the musical connection which links them together: Gabriel's home metropolis Paris and Marja's home Vuorenkylä, a tiny village surrounded by lakes and forests, where Marja lives as a sheepfarmer. The second album Lumi ('snow') was recorded in Helsinki, Finland, with top Finnish musicians. Lumi is arranged and produced by Pekka Pohjola, the famous Finnish rock/jazz musician and composer who, among others, has composed a symphony and an opera. The backing musicians on Lumi include members of Pekka's band, a string quartet, and kantele player Anu Itäpelto. The sound of the album is for the most part acoustic with the string quartet pieces recorded live in the studio. A limited edition live album Marja Mattlar Belgiassa ('Marja Mattlar in Belgium') was recorded during Marja's '96 and '97 concert tours in Belgium. She performed then as a duo with cellist Outi Rapia. The concerts were recorded and mastered by Bruno Putzeys. The third studio album Vesi ('water') was recorded mainly in Sweden and France with French, Swedish and Finnish musicians. The arrangements and production are made by Gabriel Yacoub and Jaakko Viitala, a Finnish-born musician who now lives in Sweden. Vesi is a very intimate album, concentrated on Marja's voice and rich acoustic instrumentation. The popular Finnish heavy metal group Timo Rautiainen & Trio Niskalaukaus covered three of Marja's songs on their CDs in 2000–02. This awoke interest among the rock audience in the original versions of the songs and also other songs of Marja. Having distributed Marja's records from the beginning, Edel Records Finland wanted to release a compilation album of Marja's recordings. Lintu – vuodet 1991–2001 ('Bird – the years 1991–2001'), titled according to Marja's best-known song, was released in 2002. The album contains chosen songs from the first three studio albums, one song from the live album Marja Mattlar Belgiassa, and the title songs of all the three singles. The fourth studio album Tuli ('fire'), released in 2003, was recorded in Finland with Finnish musicians. Tuli is arranged and produced by Yari, a singer-songwriter and former rock musician who has later composed film and theatre music. Yari has dramatized the songs with the help of a string quartet, kantele, guitars and keyboards. The last song Koiranelämää is performed by Marja and Timo Rautiainen & Trio Niskalaukaus together. Marja's fifth studio album Polku ('path') was released in 2007. This time the arrangements and production are made by Ilmari Issakainen and Tyko Saarikko, two members of the Finnish folk band Tenhi. The basis for producing and recording Polku was Marja's voice and acoustic guitar, the setting in which her songs are born. The songs were viewed as images to be coloured with additional instruments and sounds. Of all Marja's albums, Polku, with its arrangements and soundscapes, gets closest to the girl listening to folk music, progressive rock, and heavy metal, who bought a guitar at the turn of the 1960s and 1970s, and began writing songs and performing them. In 2008 Marja released her second live CD Vuorenkylässä ('In Vuorenkylä'), which contains a concert that she performed together with kantele player Eveliina Kontio. The concert was held in Marja's home's 150-year-old main room in July 2007. Some listeners have especially taken to the stripped-down soundscape of Marja's concerts, where she performs alone with her guitar or with one accompanist. Vuorenkylässä responds to these listeners' wishes and also documents a performance of this duo that has already performed for a decade. For her sixth studio album Kuu ('moon'), released in 2012, Marja rejoined her previous musical partner, arranger and producer Jaakko Viitala. The album's musical style was planned to be intimate but vivid, which encouraged Marja to take on a new role as a second artistic producer. Composer Otto Romanowski added electronic soundscapes to intervals between the songs, and the final track of the album Marja performs together with a men's choir. 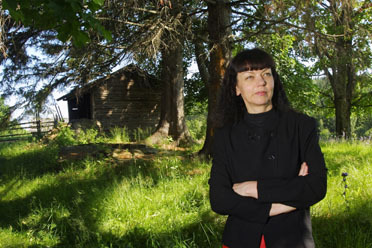 Kuu was recorded in Marja's home village, in Jaakko's studio in Sweden, and in an Orthodox church in Eastern Finland. Marja Mattlar is as uncompromising in concert as she is in studio, preferring to perform unplugged in small rooms. She has performed in this way in many small country villages throughout Finland and abroad, making full use of the intimate contact with the audience.